Having had many talks with families recently about the end of life phenomenon of terminal delirium or terminal restlessness, I wondered how this concept had been depicted visually in art. As with other gallery themes we've done on pain, the last breath and afterlife, I've scoured the Internet in search of interesting art. This first piece is a collage, Copyright 2008 Catherine King, entitled "Restless II". What I like about this piece is the subject matter of hands. So often in terminal restlessness it is the hands that are reaching and picking and pulling off sheets. 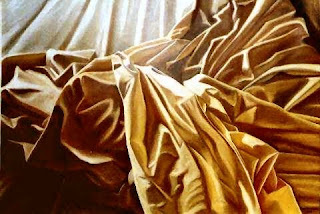 On that note of pulling off sheets, take a look at this next painting by Doug Strickland entitled "Restless". What a great visual of the way sheets look after someone with restlessness has tried in vane to rest. In the digital art/photography world is this piece by Luis Iga entitled "Restless". 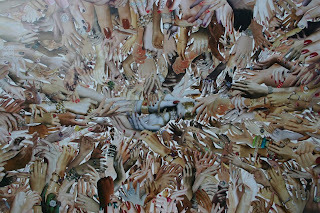 There is a face and some hands, but also the distinct impression of movement and disorientation. The distortion present again reminds me of that confusion and even hallucinations that accompany terminal delirium. I will always try to find a sculpture as a part of these themed gallery posts. I did come across a sculptor by the name Lubomir Tomaszewski. His work often is inspired by nature and he even will incorporate rock and wood. I found this one labeled "Restless Spirit" which certainly depicts the movement associated with being restless. It is always difficult to express a subjective experience visually. Although all these works are entitled "Restless" adding in the idea of terminal restlessness would add another layer to the the visual experience. I couldn't, however, find any art work with the title "Terminal Restlessness"...perhaps one of our readers could be the first! Amy I really like these symptom oriented galleries you do. What's So Hot about Immortality?